Ginés' friend, Joseph Spinden, told him about his uncle, Isamu Noguchi's atelier in Mure, a small Japanese village in Shikoku Island. The old Japanese-American sculptor spent his last years in this studio working with his assistant, Suzumi sensei. 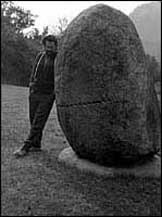 "This is where Noguchi left his most powerful art statement at the end of his life - profound respect for the soul of the stone," Ginés thought. No word can describe its combined beauty and mysticism. To the Spanish artist, a lone rock cut in half was the most impressive piece. Drawn to its strength, Ginés asked to be photographed next to it. Later, Suzumi sensei explained that before his master died, he broke the symbolic rock and requested that his ashes be placed in it. A way for the sculptor to live forever.